FASHION: is one of the most recognized and frequently seen sets. 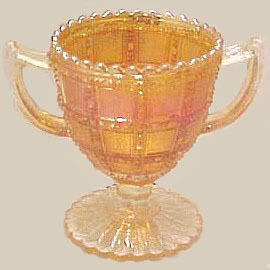 This was a favorite design from Imperial Glass.Marigold sets should not pose much difficulty in obtaining. Most of the shapes within the Fashion pattern are more easily found in Marigold. Smoke sets are scarce and the purple and helios sets will present more difficulty in locating. These small breakfast sets are quite charming, standing only 3 ½” tall. WAFFLE BLOCK: These Imperial sets are among the rare shapes to be located within this pattern offering more than 40 different shapes. They are known in clambroth and marigold. 4 1/4 in. tall with a 4 1/2 in. round opening. FROSTED BLOCK: This set offers the pedestal base. It came along rather late in the carnival era, not appearing in the wholesale catalogs until the 1920s. This is one of the patterns exported in great quantities to Central and South American countries. 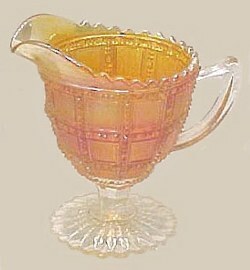 Imperial Carnival production was extensive within the pattern range of shapes. The pieces are easily obtained today, and none of the shapes can really be considered scarce. Clambroth and white are additional colors found in this set. SNOW FANCY Sugar on left, among other Imperial patterns. May and July 1922 issues of Butler Bros. Catalog. 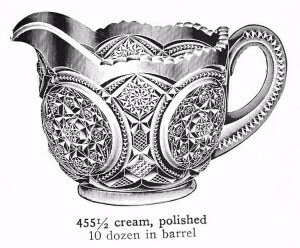 Breakfast CREAMER in SNOW FANCY as seen in Imperial Catalog # 104A. 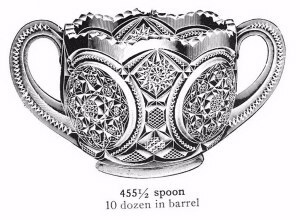 Breakfast SPOONER in SNOW FANCY as seen in Imperial Catalog # 104A. SNOW FANCY - #455 - Creamer - 6 in. handle - spout & 3 3/4 in. high. Sugar - handle to handle - 6 1/2 in. x 3 3/8 high. SNOW FANCY: Earlier written sources attributed this pattern to McKee Glass Company. It is not pictured in The Complete Book of McKee by Stout. 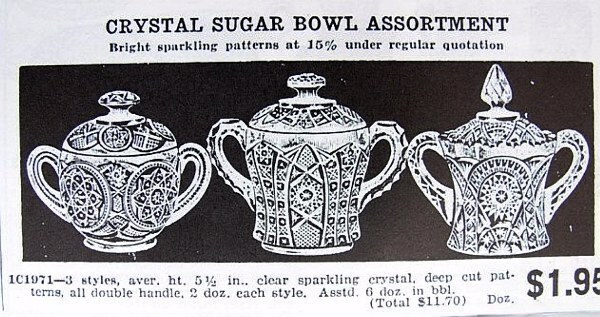 It does appear in a 1922 Butler Brothers Wholesale Catalog assortment of (crystal) covered sugar bowls, including an Octagon covered sugar by Imperial. Although Imperial Catalog No. 104A displays a complete table set on page 65A, that too, (is in polished crystal!) 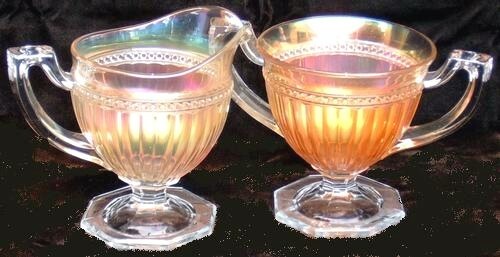 It is our belief that so far as iridized examples are concerned, deletion of a butter dish and covered sugar was decided upon, in favor of marketing the former spooner as an open sugar, along with the creamer as a complete breakfast set. These came late in the era, and only marigold sets are known. These sets are extremely scarce, don't cost very much (another rare-so-what? ), but as you can see, are quite attractive! OPTIC and BUTTONS Breakfast Set with the iron cross. OPTIC and BUTTONS: This is another virtual obscurity among the breakfast sets! There may be a clambroth set somewhere out there, but meanwhile, let us feel fortunate in knowing that the marigold exists. At least 14 shapes are known to have been iridized in this Imperial Pattern #582. PANSY: Somewhat difficult to find in purple, these little sets are quite easily located in marigold, clambroth, helios and yes, even in amber. The pastel aqua, which has been reported could pose some difficulty in locating. Imperial's Pansy pattern is always a favorite among collectors. LONG THUMBPRINT-Dugan - Sugar - 3 3/8 in. tall - Creamer -2 7/8 in. tall. Northwood FLUTE Breakfast Set in Marigold. LONG THUMBPRINT: These sets are attributed to Dugan. Quite simple in design, but all the more utilitarian in their day, a set should not create budget problems, and marigold is always a “winner”, is it not? FLUTE: This Northwood set is found in marigold and purple. Flute is one of the earliest of iridescent efforts, having come into carnival production in 1909. A fairly wide array of shapes are to be found in this #21 line. Marigold is the dominant color in berry set, water pitcher, celery vase, salt set , sherbet, 8”- 14” vase, nut cup, butter dish and covered sugar, spooner and creamer. Some of these shapes will be discussed in other segments on the 101 site. Meditation is more than reading the Bible and believing it. It's applying Scripture to everyday life. God's Word is not meant to be fast food. Take time for a good long chew. To be a healthy Christian, don't treat the Bible as snack food. Psalm 119 is a self-contained song (not an actual chapter), but remains the longest Scripture portion in the Bible with its 176 verses. The psalm is also in the form of an acrostic, with each 8-verse stanza beginning consecutively with a different letter of the 22-letter Hebrew alphabet.